What a beautiful little car! 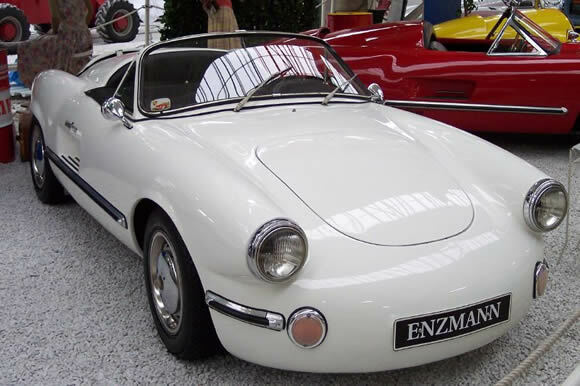 Built by the Enzmann brothers in Schupfen, Switzerland between 1956 and 1961, Enzmann cars made quite an impact. They also put the wind up Porsche 550 owners who probably weren't too impressed with being passed in the mountains. Enzmann used to buy new Volkswagens, unbolt the Beetle shells from the floorpans, and bolt the very cool body you see above on. Sources say only 100 cars were built and although looked down upon by some because of the Beetle origin most of them had 130hp Porsche 356 motors making the lightweight car, around 510kgs, a potent little package. Some owners fitted the motors with Okrasa parts from EMPI and some even braver ones put MAG and Judson Superchargers on them. Excellent! Check out the Enzmann website at http://www.enzmann-506.ch/ if you are interested because they are making the body's again.